As you already know recently Adrien Broner was shot at last night, arrested, and released from jail today. As I sit here in my room, I was thinking why is it that he continuously always finds himself in a messy situation involving the law? Now I am not a fan of his antics outside of boxing and I know a lot of the foolishness he says every time a microphone is placed near his mouth, is to play the villain and sell tickets. What he doesn’t understand is, is that his behavior overshadows his in the ring skill and it turns a lot people off. Now when the cameras are away and you get to talk to him one on one he is a cool dude, but the networks and television doesn’t see that. Majority of fans that follows boxing view him in a negative light. In 2007 he was arrested and charged with aggravated robbery, and two counts of felonious assault and battery. Those charges were eventually dropped. In September of 2008 Adrien was charged with carrying a concealed weapon. He was acquitted a year late. While awaiting trial for that charge with carrying a concealed weapon he was charged in December of 2008 for intimidation of a witness and aggravated menacing. Those charges were dismissed due to a lack of credible evidence. December 2012 Adrien was arrested for assault and battery. 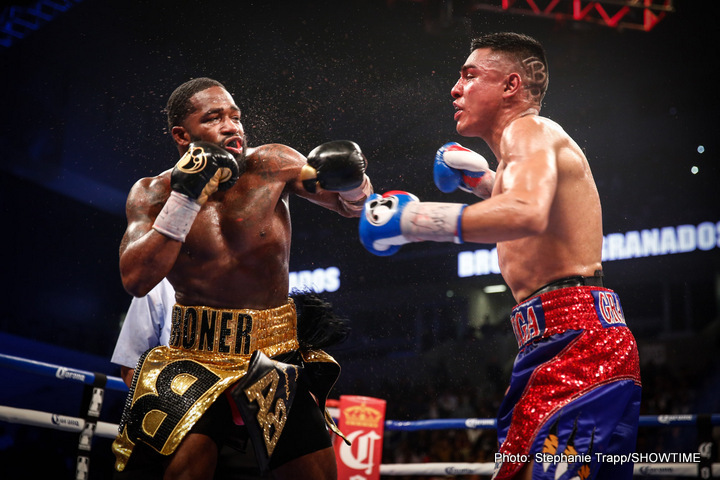 April 2016 Adrien Broner turned himself in due to having two felony warrants in connection of charges of felony assault and aggravated robbery about an incident that happened in January that same year. And now last night Adrien was arrested in Kentucky after his SUV gets shot up because he has an outstanding warrant for failing to appear for a 2014 court case in Covington, Kentucky, on charges of alcohol intoxication in a public place and disorderly conduct? These are just seven I mention. What I want Adrien Broner to do is WAKE THE FREAK UP!!! You have been blessed with a talent that provides you and your family a better way of life. You have 5 children that depends on you and you are responsible for. Granted a lot of these charges that were mentioned earlier was dismissed or downgraded. The thing is where there is smoke there is fire. In other words you so happened to always be near the scene when bad things go down. I hope that you read this, because you just happen to be fortunate enough that whoever shot at you didn’t have their glasses on. The vehicle was struck multiple times and you escape with no injuries. Do you understand that? You could have been toe-tagged in the morgue while your children end up fatherless. If you want to see longevity and be around to watch your children grow up you need to make some life changing choices. My suggestion to you is to find you some new friends that have positive ambitions in life. Because the bad company you keep can be your downfall. Maybe you need to leave Ohio altogether and leave that Thug Life behind. Recondition your mind. Think with your wallet instead of your ego. In other words, if any action or decision I make has the potential to take food from your family or jeopardize their positive way of life then don’t do it. There is too many of young men with talent that are lying up in prison or in the ground, because of unwise decisions. There’s one boxer that comes to mind that made it, but that life style eventually took his freedom, money, and life away. The legendary Hector Macho Camacho. As much as I respect him and his family, it was his lifestyle and the company he kept around eventually was his downfall. There was a football player who recently supposedly committed suicide while serving life sentence in prison for murder. He has been in trouble ever since he was a teenager. He was extremely talented and a couple highly respected people took a chance on him and he was able make millions in the NFL. But once again he was unable to let that gangland lifestyle go which ended up being his undoing. You are young talented man with a gift. It’s upsetting that you don’t really know how many young boys and young men from your hometown look up to you as a role model or the measure of success. I just hope this message reaches you well and in time before it’s too late. Personally I really don’t care about AB the boxer, I’m more concern about Adrien Broner, the person.